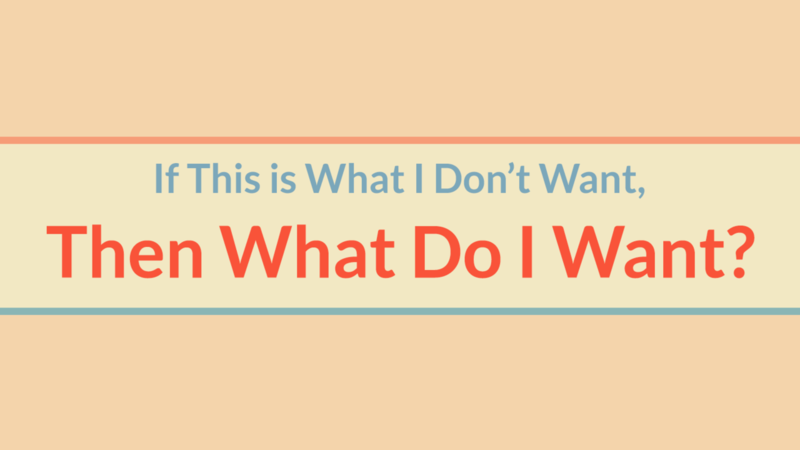 Talent2Strength: If This is What I Don’t Want, Then What Do I Want? Now, contrast goes by many names: drama, discord, stress, anxiety. The causes vary but the experience of contrast is universal. It is characterized by negative emotions. It’s our hard wired way of knowing when there is contrast. The problem is that negative emotions warp our vision so we do not see clearly. While this is true, contrast provides information we cannot otherwise gain. The realization of what it is we want. If only we could suspend the tumult caused by negative emotions long enough to ask one question: If this is what I don’t want, then what do I want? I have seen many examples of contrast, I have also witnessed varied responses to it ranging from counter-productive to highly productive. Contrast cannot be avoided if change is desired. It is a powerful tool that can move individuals and organizations toward greater alignment if perceived from the proper vantage point. The greatest challenge is recognizing contrast as a useful tool as opposed to become debilitated by the negative emotions it produces within us. Disappointment, anger and fear breeds inefficiency. We have all been caught in the quicksand of negative emotions where objectivity is paralyzed, and we fail to take the appropriate actions. Contrast can be leveraged in very useful ways when we refuse to have negative responses to it. We learn to view contrast as a compass towards greater alignment instead of avoiding it. First we must ask ourselves, “If this is what I don’t want, then what is it that I do want?” When we take inventory of contrast in our lives, it becomes the dawning of a new order of that which we desire, rather than the finite state of our affairs. Once we begin to view contrast in this way, we may recall numerous instances of the successful conversion of contrast into alignment within our own career or life. Some of your greatest accomplishments have very likely taken formation through the realization that a circumstance fraught with contrast necessitated change as the only means to align more fully with your goals and values. The problem is that, for many of us, this is not a regular, daily practice. But it can be. If contrast is characterized by negative emotions then alignment is identified by positive emotions such as contentment, joy or engagement. One client used her talents to resolve an area of contrast in her life. She hated to exercise but knew she needed to as her lack of exercise was impacting her energy and health. Through coaching we identified ways she might work around the contrast and find a way to exercise that would play to her strengths. She applied her Ideation talent to come up with some interesting thoughts that might work for her. She then chose a few to implement such as using her three Relationship Building talents (Connectedness, Empathy, and Positivity) to schedule walks with friends whose company she enjoys. On other walks she listens to lectures on her Ipod thus engaging her mind and satisfying her Learner talent. She also invested in a health tracking device so her Ideation and Learner would engage in tracking the tangible results of her efforts. Thus, she moved an area of her life out of contrast and into alignment with extremely positive results. When we know what we want, or what others want, we can formulate a positive plan to get there so long as we haven’t succumbed too long to negative emotions. Applying our talents moves us out of contrast and into alignment.